Sergei Mikhailovich Sukhotin was born in Russia in 1887. He became a lieutenant in the Preobrazhensky Regiment. In 1916, Sukhotin joined Prince Felix Yusupov, Vladimir Purishkevich, the leader of the monarchists in the Duma, Grand Duke Dmitri Pavlovich Romanov, and Dr. Stanislaus de Lazovert in a conspiracy to muder Grigory Rasputin. Prince Felix Yusupov later admitted in Lost Splendor (1953) that on 29th December, 1916, Rasputin was invited to his home: "The bell rang, announcing the arrival of Dmitrii Pavlovich Romanov and my other friends. I showed them into the dining room and they stood for a little while, silently examining the spot where Rasputin was to meet his end. I took from the ebony cabinet a box containing the poison and laid it on the table. Dr Lazovert put on rubber gloves and ground the cyanide of potassium crystals to powder. Then, lifting the top of each cake, he sprinkled the inside with a dose of poison, which, according to him, was sufficient to kill several men instantly. There was an impressive silence. We all followed the doctor's movements with emotion. There remained the glasses into which cyanide was to be poured. It was decided to do this at the last moment so that the poison should not evaporate and lose its potency. We had to give the impression of having just finished supper for I had warned Rasputin that when we had guests we took our meals in the basement and that I sometimes stayed there alone to read or work while my friends went upstairs to smoke in my study." Felix Yusupov added: "It was agreed that when I went to fetch Rasputin, Dmitrii, Purishkevich and Sukhotin would go upstairs and play the gramophone, choosing lively tunes. I wanted to keep Rasputin in a good humour and remove any distrust that might be lurking in his mind." Stanislaus de Lazovert now went to fetch Rasputin in the car. "At midnight the associates of the Prince concealed themselves while I entered the car and drove to the home of the monk. He admitted me in person. Rasputin was in a gay mood. We drove rapidly to the home of the Prince and descended to the library, lighted only by a blazing log in the huge chimney-place. A small table was spread with cakes and rare wines - three kinds of the wine were poisoned and so were the cakes. The monk threw himself into a chair, his humour expanding with the warmth of the room. He told of his successes, his plots, of the imminent success of the German arms and that the Kaiser would soon be seen in Petrograd. At a proper moment he was offered the wine and the cakes. He drank the wine and devoured the cakes. Hours slipped by, but there was no sign that the poison had taken effect. The monk was even merrier than before. We were seized with an insane dread that this man was inviolable, that he was superhuman, that he couldn't be killed. It was a frightful sensation. He glared at us with his black, black eyes as though he read our minds and would fool us." Felix Yusupov later recalled: "On hearing the shot my friends rushed in. Rasputin lay on his back. His features twitched in nervous spasms; his hands were clenched, his eyes closed. A bloodstain was spreading on his silk blouse. A few minutes later all movement ceased. We bent over his body to examine it. The doctor declared that the bullet had struck him in the region of the heart. There was no possibility of doubt: Rasputin was dead. We turned off the light and went up to my room, after locking the basement door." Rasputin's body was found on 19th December by a river policeman who was walking on the ice. He noticed a fur coat trapped beneath, approximately 65 metres from the bridge. The ice was cut open and Rasputin's frozen body discovered. The post mortem was held the following day. Major-General Popel carried out the investigation of the murder. 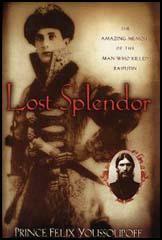 By this time Sukhotin and Dr. Stanislaus de Lazovert had fled from the city. He did interview Felix Yusupov, Dmitri Pavlovich Romanov and Vladimir Purishkevich, but he decided not to charge them with murder. Sergei Mikhailovich Sukhotin died in Paris in 1926. The shot that ended the career of the blackest devil in Russian history was fired by my close and beloved friend, Vladimir Purishkevich, Reactionary Deputy of the Duma. Five of us had been arranging for this event for many months. On the night of the killing, after all details had been arranged, I drove to the Imperial Palace in an automobile and persuaded this black devil to accompany me to the home of Prince Yusupov, in Petrograd. Later that night M. Purishkevich followed him into the gardens adjoining Yusupov's house and shot him to death with an automatic revolver. We then carried his riddled body in a sheet to the River Neva, broke the ice and cast him in. The story of Rasputin and his clique is well known. They sent the army to the trenches without food or arms, they left them there to be slaughtered, they betrayed Rumania and deceived the Allies, they almost succeeded in delivering Russia bodily to the Germans. 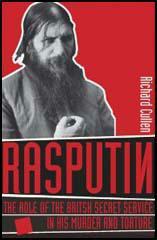 Rasputin, as a secret member of the Austrian Green Hand, had absolute power in Court. The Tsar was a nonentity, a kind of Hamlet, his only desire being to abdicate and escape the whole vile business. Rasputin continued his life of vice, carousing and passion. The Grand Duchess reported these things to the Tsarina and was banished from Court for her pains. This was the condition of affairs when we decided to kill this monster. Only five men participated in it. They were the Grand Duke Dmitri Pavlovich, Prince Yusupov, Vladimir Purishkevich, Captain Sukhotin and myself. Prince Yusupov's palace is a magnificent place on the Nevska. The great hall has six equal sides and in each hall is a heavy oaken door. One leads out into the gardens, the one opposite leads down a broad flight of marble stairs to the huge dining room, one to the library, etc. At midnight the associates of the Prince concealed themselves while I entered the car and drove to the home of the monk. He admitted me in person. Rasputin was in a gay mood. We drove rapidly to the home of the Prince and descended to the library, lighted only by a blazing log in the huge chimney-place. A small table was spread with cakes and rare wines - three kinds of the wine were poisoned and so were the cakes. The monk threw himself into a chair, his humour expanding with the warmth of the room. He told of his successes, his plots, of the imminent success of the German arms and that the Kaiser would soon be seen in Petrograd. At a proper moment he was offered the wine and the cakes. He drank the wine and devoured the cakes. Hours slipped by, but there was no sign that the poison had taken effect. The monk was even merrier than before. We were seized with an insane dread that this man was inviolable, that he was superhuman, that he couldn't be killed. It was a frightful sensation. He glared at us with his black, black eyes as though he read our minds and would fool us. And then after a time he rose and walked to the door. We were afraid that our work had been in vain. Suddenly, as he turned at the door, some one shot at him quickly. With a frightful scream Rasputin whirled and fell, face down, on the floor. The others came bounding over to him and stood over his prostrate, writhing body. It was suggested that two more shots be fired to make certain of his death, but one of those present said, "No, no; it is his last agony now." We left the room to let him die alone, and to plan for his removal and obliteration. Suddenly we heard a strange and unearthly sound behind the huge door that led into the library. The door was slowly pushed open, and there was Rasputin on his hands and knees, the bloody froth gushing from his mouth, his terrible eyes bulging from their sockets. With an amazing strength he sprang toward the door that led into the gardens, wrenched it open and passed out. As he seemed to be disappearing in the darkness, F. Purishkevich, who had been standing by, reached over and picked up an American-made automatic revolver and fired two shots swiftly into his retreating figure. We heard him fall with a groan, and later when we approached the body he was very still and cold and - dead. We bundled him up in a sheet and carried him to the river's edge. Ice had formed, but we broke it and threw him in. The next day search was made for Rasputin, but no trace was found. Urged on by the Tsarina, the police made frantic efforts, and finally a rubber was found which was identified as his. The river was dragged and the body recovered. I escaped from the country. Purishkevich also escaped. But Prince Yusupov was arrested and confined to the boundaries of his estate. He was later released because of the popular approval of our act. Russia had been freed from the vilest tyrant in her history; and that is all. I opened the car doors quietly and, as quickly as possible, jumped out and went over to the railing. The soldier and Dr Lazovert followed me and then Lieutenant S., who had been sitting by the grand duke, joined us and together we swung Rasputin's corpse and flung it forcefully into the ice hole just by the bridge. (Dmitrii Pavlovich stood guard in front of the car.) Since we had forgotten to fasten the weights on the corpse with a chain, we hastily threw these, one after another, after it. Likewise, we stuffed the chains into the dead man's coat and threw it into the same hole. Next, Dr Lazovert searched in the dark car and found one of Rasputin's boots, which he also flung off the bridge. All of this took no more than two or three minutes. Then Dr Lazovert, Lieutenant S. and the soldier got into the back of the car, and I got in next to Dmitrii Pavlovich. We turned on the headlights again and crossed the bridge. How we failed to be noticed on the bridge is still amazing to me to this day. For, as we passed the sentry-box, we noticed a guard next to it. But he was sleeping so deeply that he had apparently not woken up even when... we had inadvertently not only lit up his sentry-box, but had even turned the lights on him.